Not Another Memorial Day Sale! I had this week’s newsletter laid out and was ready to upload it, when I got a disturbing email from a small business coach I respect a great deal. It was a Memorial Day promotion of one of his excellent products. But the email was wide of the mark. He reminisced about Memorial Day when he as a boy, and described is as the “biggest party of the year” and said the entire weekend was “one great big celebration.” No mention of what the holiday is about. So, when I came to this line, I recoiled in disbelief: “So, for this entire weekend I want to celebrate all the brave, hardworking, loyal, innovative and creative small business owners out there by running a 50% off…” then he named the product. It truly is an excellent product, but that doesn’t matter. When I saw the words “brave, hardworking and loyal” I thought he might be describing veterans who died in service of our nation – those the holiday is intended to honor. In other words, he has missed the whole point of the holiday his entire life. I sent him an email and told him that, nicely. Here is the response I sent him. I received your second email this morning after reading the first with disappointment. I applaud you for sending the note of explanation, and I believe it to be heartfelt, not calculated. In your second email you put your finger on what is a serious disconnect in American society when you said, “that aspect of the Holiday has not directly touched my family.” I believe it has, but you were unaware. Each of us has a stake in any lives sacrificed on our behalves. I also have fond recollections of Memorial Day from my childhood. 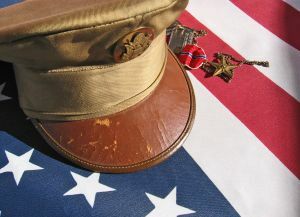 In the early 1950s, the world was still recovering from the Second World War, the United States was fighting yet another war in Korea and we still had a large number of World War I veterans with us. Veterans in my small Ohio town of Waynesfield proudly wore their service uniforms and marched down Main Street to the cemetery. We kids decorated our bicycles with red, white and blue crepe paper and rode behind the veterans, ahead of the high school band. I watched as the adults stood silently and unashamedly brushed back tears. As the reading ended, a squad of veterans fired a salute of three rounds from their rifles, and the solemn sound of Taps wafted over the tombstones. Only then did the picnics and cookouts begin. It’s all a matter of priorities. I have no problem with Memorial Day sales, or nearly any other kind of holiday sale. But not at the expense of the purpose of the holiday. With fewer than 1% of our nation serving in or being family members of our military forces, it’s not difficult to imagine that many people have no idea at all about the sacrifices they make every day, let alone those who surrender their lives in the cause. But we must learn. If you can’t find a Memorial Day parade or commemoration locally, I urge you to tune in to CSPAN TV Monday morning to watch the ceremonies from Arlington National Cemetery, Virginia. The president will place a wreath at the Tomb of the Unknown, then salute our fallen heroes with a short address. It is always a moving experience.